Our primary passion is to use science to help people develop health and well-being. Health. We focus on the promotion of healthy living, which includes weight loss and increasing health-related behaviors. We see health as the foundation that supports all our vital activities. Well-being. When seeking to improve our health behavior, we need to look at our whole lives, not just what we put into our mouths. We need to build a life that involves joy, and meaning, and that will give us the motivation to improve our health. 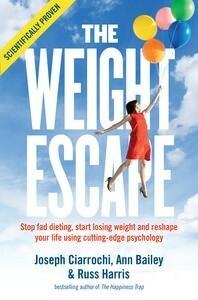 We at Weight Escape help people to discover what they value, that is, what they most deeply care about and love doing. Then we show them how to activate those values in their day-to-day lives. More specifically, we help people to answer these questions for themselves. 1) How will weight loss (or other health behavior) improve my health? 2) How will health help me to express friendship and love? 3) How will health help me to influence the world? 4) How will health help me to find joy? 3) To offer our clients honesty, compassion, commitment and energy in the service of their values. 4) To fight against weight-related prejudice and stigma. To fight against the idea that being overweight is an indication of weakness, low willpower, or some other psychological deficiency. 5) To recognize that our clients and we are in the same boat. We all struggle to stay present, deal with intense emotions, remember our values, and stay committed to vital action. 6) To provide maximum benefit at minimum cost. 7) To provide free support for people beyond the face-to-face contact. Such support will be in the form of e-courses, free materials, and a newsletter. 8) To make our protocols, innovations or measures related to ACT or to ACT in combination with other procedures rapidly and readily available, for free where practical or for a low cost, and without unnecessary restrictions.